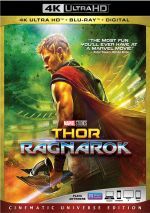 Imprisoned on the other side of the universe, Thor finds himself in a race against time to get back to Asgard to stop Ragnarok, the destruction of his homeworld and the end of Asgardian civilization, at the hands of an all-powerful new threat, the ruthless Hela. Our favorite Norse god leads his third cinematic adventure via 2017’s Thor: Ragnarok. Thor (Chris Hemsworth) learns of “Ragnarok”, an apocalyptic event that would cause the end of his home Asgard. When Thor returns to Asgard, he finds his wicked brother Loki (Tom Hiddleston) in charge and father Odin (Anthony Hopkins) in exile. Thor locates Odin in Norway, where the ruler’s death allows for the return of Hela (Cate Blanchett), the sister Thor never knew he had. Odin put Hela into exile due to the threat she brought, a choice that makes sense when she returns and immediately lays waste to Asgard’s defenders. Thor winds up stuck on a strange, distant planet and needs to find a way back to Asgard to defeat Hela and restore order. As an aging comic book nerd, I occasionally find myself put off by the ways superhero flicks alter the established characters. That’s been a bone of contention with the post-Raimi Spider-Man films, and it’s a major problem with Man of Steel, among other films. I admit I can be too pedantic about this, as I should accept cinematic adaptations as their own beasts. These movies don’t need remain perfectly true to the comics, really – I can gripe about choices when I don’t think they work, but I probably shouldn’t whine too much about changes solely because they deviate from the source. So I won’t criticize Ragnarok because it alters Thor from the comics. Instead, I’ll criticize Ragnarok because it lacks internal consistency when viewed as part of the Marvel Cinematic Universe (MCU). 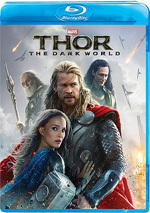 Across 2011’s Thor and 2013’s Thor; The Dark World - as well as the two Avengers flicks – we got a God of Thunder fairly comparable to the one from the comics. Sure, Thor altered Thor’s origin story – and completely omitted his comic alter ego – but the character himself still felt like the noble, haughty hero we knew. On the other hand, Ragnarok brings us a Thor who seems to have undergone a pretty radical personality transformation. He’s much more inclined to goofiness and he feels less heroic, as he shows more anxiety and less confidence than in the past. Elsewhere on this disc, director Taika Waititi and others involved try to justify these changes. They claim that Tony “Iron Man” Stark has rubbed off on Thor and made him a lot more loosey-goosey. Okay – sure, maybe, that’s possible. But if so, why don’t any of the other Avengers show similar alterations in behavior? I’d argue Steve “Captain America” Rogers boasts minor shifts – mainly due to his increased cynicism in regard to authority figures – but he’s still easily recognizable as the true blue patriotic hero of old. Thor really does come across like a wimpier, dumber version of himself. Sometimes it feels like the filmmakers took a discarded Guardians of the Galaxy script, crossed out “Star Lord” and wrote in “Thor” instead. It doesn’t work, mainly because Thor seems like such a buffoon. Of course, the movie allows him to redeem himself and show heroism along the way, but it forces him to seem wimpering and simpering. Thor almost cries because he gets a haircut? Really? It’s like Hemsworth decided to play Thor as the cousin of his vapid Ghostbusters role. The first two Thor flicks had their share of comedy, but they didn’t come with the incessant glibness of Ragnarok. Because of this, Ragnarok often feels like a superhero movie made by people who want to mock superhero movies. Despite these major problems, I admit Ragnarok musters entertainment at times, largely via its lively action scenes. New castmembers Cate Blanchett and Jeff Goldblum camp it up but they still give the movie life, and unlike his cinematic brother, Hiddleston brings the same devilish charm to Loki we got in the first two films – at least some characters maintain internal consistency. Ragnarok brings a brisk ride that works best on first viewing, but when seen again, its inherent idiocy and superficiality make it less enjoyable. This isn’t a dull movie but it’s one that disappoints. Footnote: you shouldn’t need me to tell you this, but stick around through the end credits for extra footage. 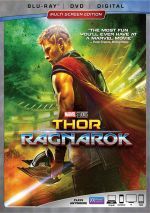 Thor: Ragnarok appears in an aspect ratio of approximately 2.40:1 on this Blu-ray Disc. From start to finish, the movie looked solid. Sharpness worked well. Few if any signs of softness occurred, so I thought the film consistently displayed tight, precise visuals. No moiré effects or jagged edges appeared, and I witnessed no print flaws. To the surprise of no one, the film emphasized the usual orange and teal palette. That said, the movie came with a good array of other hues – especially in the Grandmaster’s world – so the orange/teal wasn’t oppressive. We got a nice blend of hues, all of which looked strong. Blacks were deep and firm, while shadows offered smooth, clear visuals. I felt impressed by this fine presentation. Just as good as the picture, the movie’s DTS-HD MA 7.1 soundtrack added a lot of pizzazz to the package. With so much action and havoc, the soundscape enjoyed a slew of chances to come to life, and it did so well. Audio quality also succeeded. Music was bold and full, while speech seemed concise and well-rendered. Effects appeared accurate and dynamic, with terrific low-end. I felt pleased with this exciting soundtrack. Footnote: the disc’s menus used much louder audio than the movie itself. Just a warning to crank down the volume before you return to the menus! We get a decent array of extras here, and these open with an audio commentary from director Taika Waititi. He offers a running, screen-specific look at cast and performances, effects, stunts, music, sets and locations, and various bits of trivia. During the commentary's first segment, Waititi does little more than crack wise - and without much impact, as his remarks don't seem all that funny. He settles down after a while and offers more filmmaking substance as the track proceeds, but not enough to make this a particularly informative chat. We get a decent smattering of notes but Waititi wastes too much time with nonsense along the way. We can watch the movie with or without a Director’s Intro. In this one-minute, 44-second clip, Waititi jokes around some more. He’s funny in small doses, so the intro goes down better than the tedious commentary. Five movie-related featurettes fill a total of 34 minutes, 24 seconds. We find “Getting In Touch With Your Inner Thor” (6:39), “Unstoppable Women” (5:59), “Finding Korg” (7:34), “Sakaar: On the Edge of the Known and Unknown” (8:25) and “Journey Into Mystery” (5:47). Across these, we hear from Waititi, executive producer Brad Winderbaum, producer Kevin Feige, dialect coach Andrew Jack, screenwriter Eric Pearson, visual effects supervisor Jake Morrison, costume designer Mayes C. Rubeo, production designer Dan Hennah, comic writer Walt Simonson, and actors Chris Hemsworth, Anthony Hopkins, Mark Ruffalo, Cate Blanchett, Jeff Goldblum, Tom Hiddleston, Tessa Thompson, and Karl Urban. The clips look at the depiction of Thor, cast, characters and performances, Waititi’s impact on the production, the design of the Sakaar sets, and connections to the comics. The shows mix useful facts with lots of happy talk to become sporadically informative. Next comes a Gag Reel. It spans a mere two minutes, 18 seconds and delivers the usual silliness and goof-ups. Don’t expect much from it. A short film entitled Team Darryl lasts six minutes, eight seconds. It expands prior shorts that made Thor the roommate of Australian Darryl, as the Grandmaster moves in with the human. It runs a little too long but it still amuses. Five Deleted Scenes take up a total of seven minutes, 20 seconds. 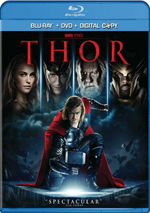 These include “Thor Meets the Grandmaster (Extended Scene)” (2:12), “Stupid Avenger vs. Tiny Avenger (Extended Scene)” (2:07), “Grandmaster and Topaz (Extended Scene)” (1:13), “Skurge Finds Heimdall” (0:43), and “Hulk Chases Thor Through Sakaar” (0:54). The three extensions just add more comedy, and since they emphasize Goldblum, that’s fine with me. “Skurge” offers a minor bit of exposition, while “Chases” brings some action. Neither adds much. A featurette called Marvel Studios: The First Ten Years – The Evolution of Heroes goes for five minutes, 23 seconds. It offers notes from Feige, Hemsworth, Ruffalo, Marvel Studios co-president Louis D’Esposito, directors Anthony and Joe Russo, and actors Robert Downey Jr., Chadwick Boseman, Elizabeth Olsen, Benedict Cumberbatch, Scarlett Johansson and Chris Evans. “Heroes” offers a quick overview of the MCU from 2008 to date. It feels like the promo piece it essentially is. Two 8-Bit Sequences appear: “Sakaar Spaceship Battles” (0:58) and “Final Bridge Battle” (2:17). These claim to offer pre-vis segments used to plan for those scenes, though they’re really just gags, as they show the scenes ala the style of 1980s video games. They’re cute and that’s about it. The disc opens with an ad for Black Panther. Sneak Peeks throws in promos for various Marvel-based video games. No trailer for Ragnarok appears here. Packed with action, Thor: Ragnarok throws enough at the wall that some of it sticks. However, its relentlessly jokey tone feels out of place for the characters and subject matter, so the film sputters too much of the time. The Blu-ray offers very strong picture and audio plus a generally positive collection of supplements that loses points due to a weak audio commentary. Ragnarok goes too far into Wacky Land for its own good.